In the 1850’s Aurélien Houchart created one of the largest wineries in Provence. The Domaine was later divided amongst his five children. Geneviève Quiot, who runs the Domaine today, inherited 50 hectares of vines from her grandfather. Located at about 25km east of Aix-En-Provence, the vines are old-between 30 and 50 years. The grape varieties grown onsite are typical to Provence; Grenache, Cinsault, Syrah, Carignan, Mourvedre and Cabernet Sauvignon. With 50 hectares under vine, there is a variety of soil types; sandy, chalky, clay and silt- ensuring that the vines have proper drainage and produce and grapes that can develop a variety of interesting characteristics. 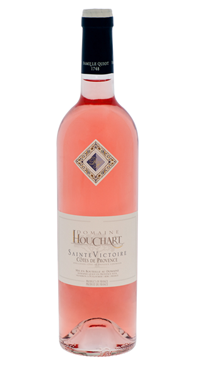 This Cote de Provence rose is a blend of Cinsault, Grenache Noir, Mourvèdre and Syrah. The grapes grow on well drained gravel and limestone soil. The wine is made by direct pressing and after fermentation, the juice matures on the fine lees for four months adding a creamy mid palate texture. Red berry aromas of strawberries and redcurrants and elements of “terroir” are expressed through the wine’s minerality. This wine will go with almost any Valentine’s Day dinner you have planned!